Raging storms descended upon us every afternoon and evening and into the night. The week before we had a breach in the lining of our koi pond. 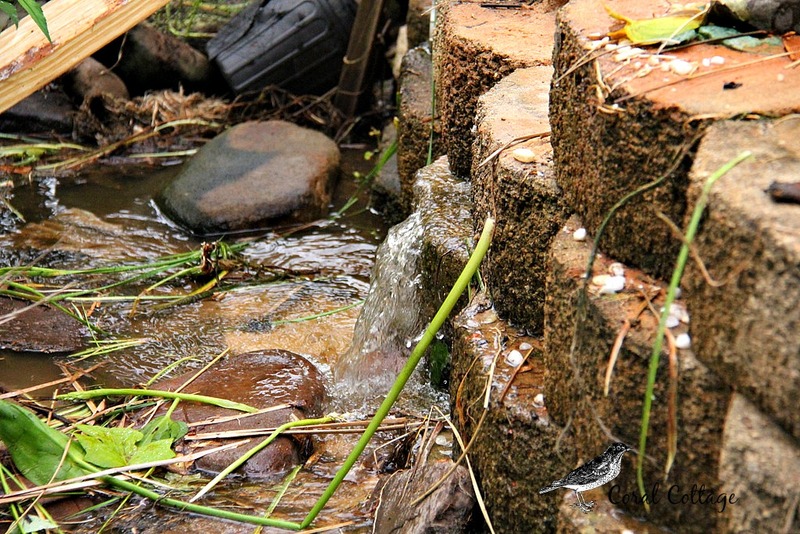 We were thankful for all the rain, as it helped fill the pond back up. Pond grasses had grown through the seam in the liner of the pond and broke through causing a major leak. Yep, that’s water gushing out of the side of pond wall. The water had to be drained down further so the repair could be made. Mr. Cottage and Cottage friend, spent hours pulling out plants, moving rocks and diverting water, trying to keep the fish safe. 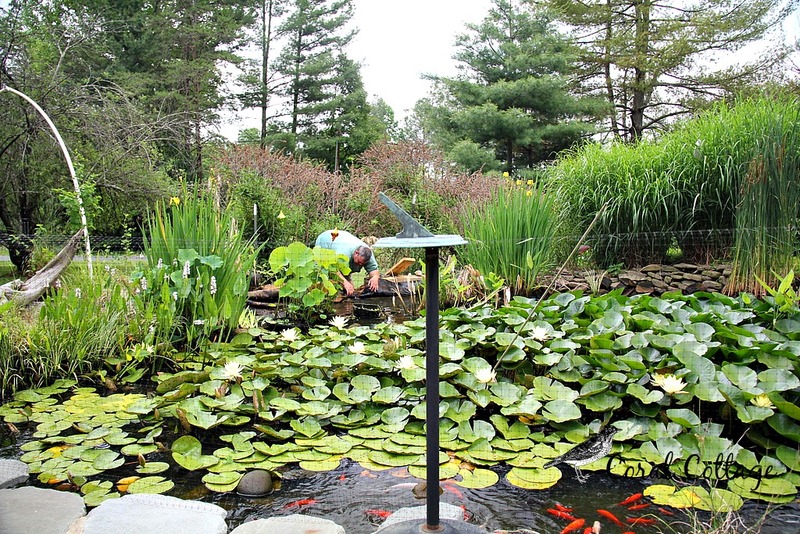 The pond was overdue for plant dividing and thinning. 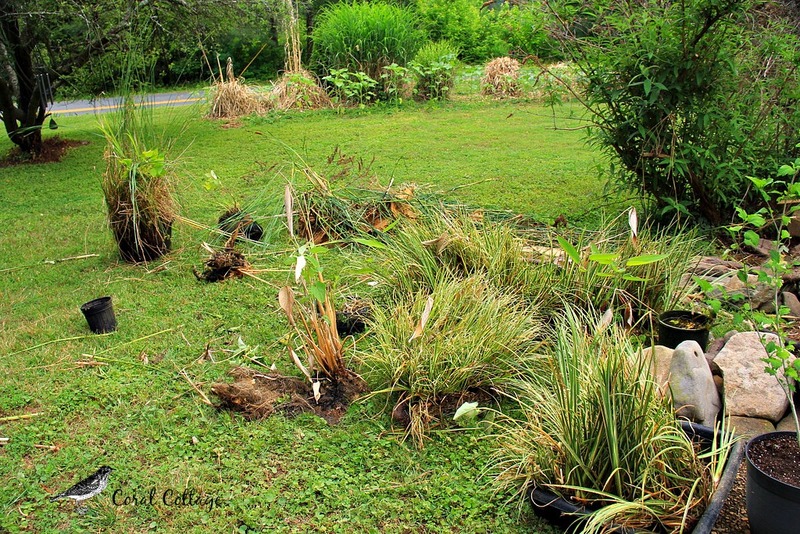 Plants were spread all over the lawn, ready to be divided and moved to another location. The variegated sweet flag was so thick and heavy that the guys had to take planks of wood to use for leverage to get the grass out of the pond. 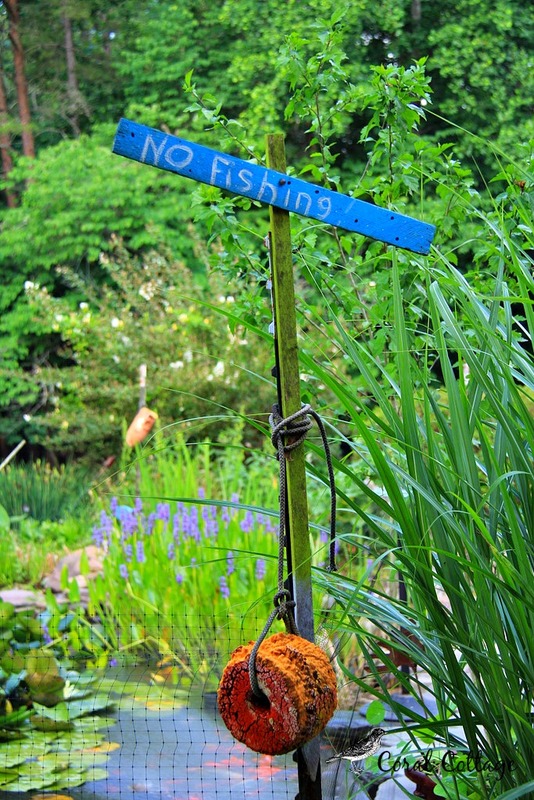 We relocated cat tails, grasses and some iris to the back pond in the enchanted forest. A week later, we got the pond filled, and the pump going. The repair seems to have worked and all the fish are safe and sound. Before the water level was brought back up, I got to take a few photos at their eye level. That Cat had a visitor at the edge of the North 40. They had a long visit and then they each went their separate ways. I haven’t had much time at home lately for cooking, or cleaning or well anything. Staci, over at Life at Cobble Hill Farm, inspires me with all her wonderful cooking. 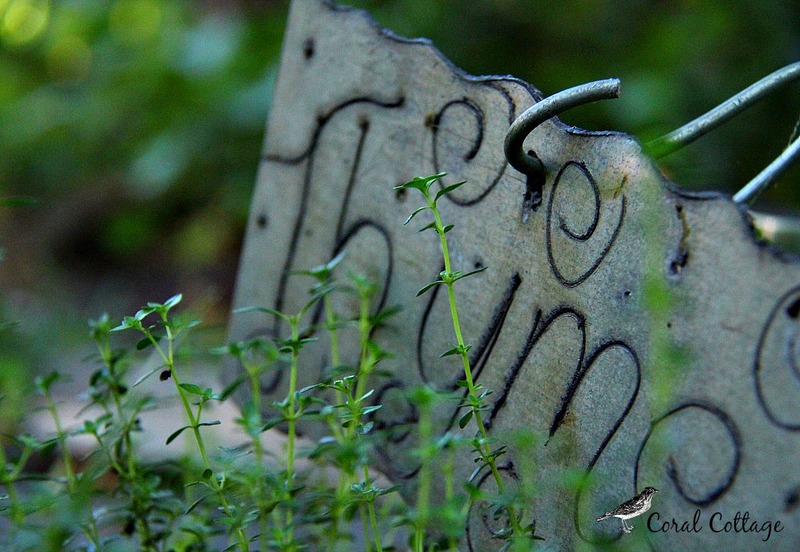 So this afternoon I took a stroll out to the new herb garden we put in this spring. It is just a few steps outside the kitchen door – more about that later. I grabbed a handful of herbs and headed in to the kitchen. One of my favorite comfort meals is roasting in the oven as I write this. 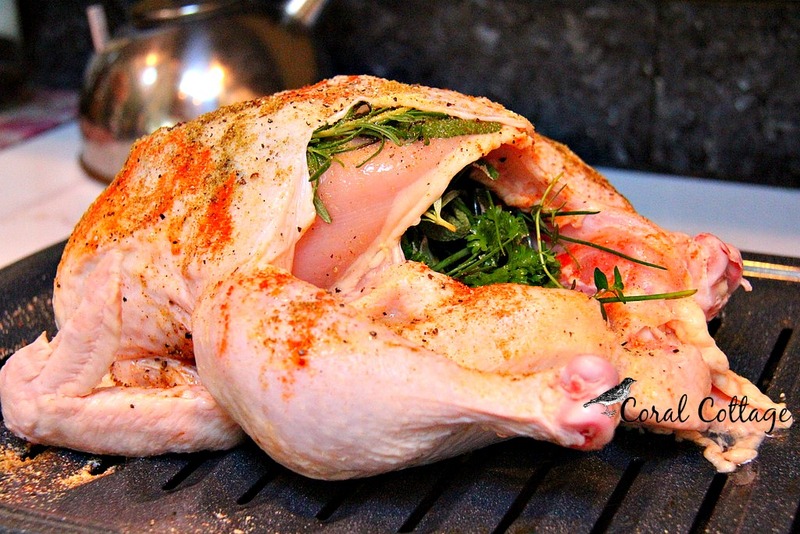 Roast chicken, with fresh herbs from the garden. A mountain of mashed potatoes and fresh corn on the cob. A pan simmering on the stove with a gallon of gravy. I stuff the herbs under the skin and in the cavity for even bursts of herbalushness. Comfort in the form of carbs. And Butter. And gravy. I hope your days have been full of sunshine and goodness. Kim of Red Dirt Farm • This entry was posted in Cooking, Country living and tagged cats, cooking, fluvanna, herb gardening, koi pond, life at coral cottage, va. Bookmark the permalink. Such beauty in your post today! 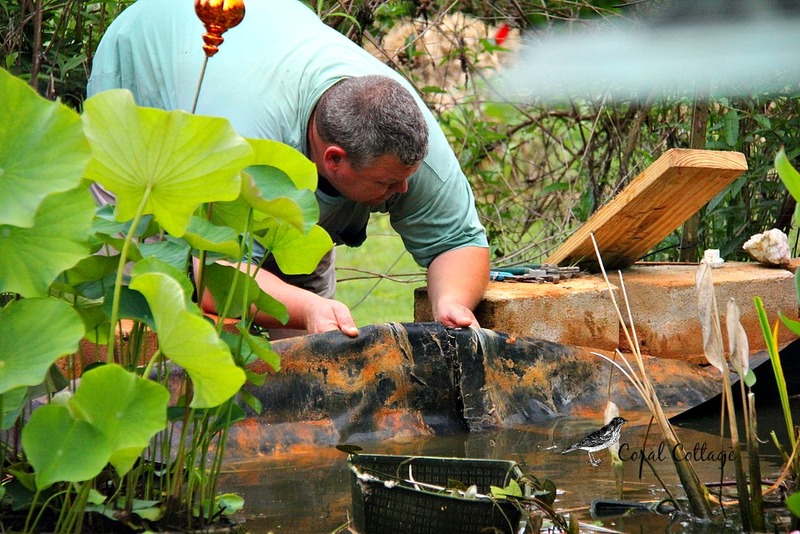 The fish pond is simply out of this world! I have never seen one so large and lovely. Your photos show it off very well. 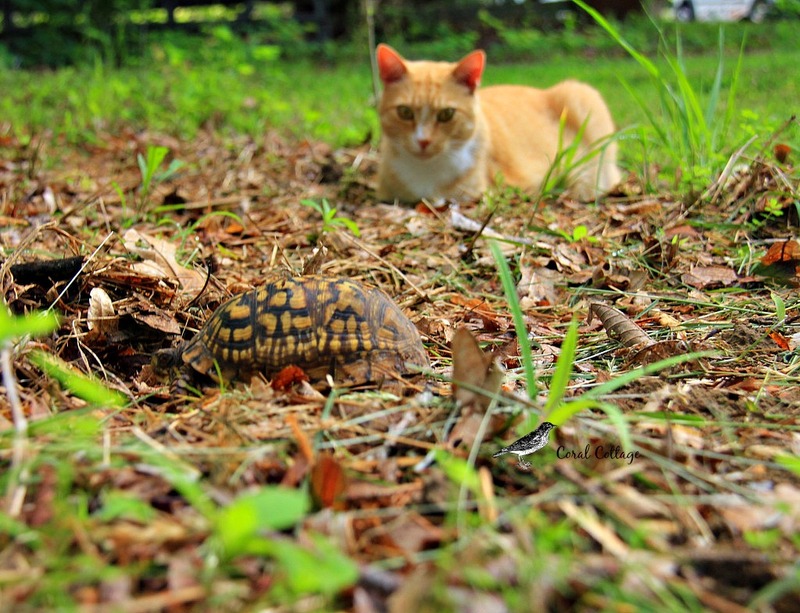 That chicken with your own herbs looks divine, and you got a great shot of the cat and the turtle. I would love to see photos of the enchanted forest and back pond sometime. Maybe I already have and don’t remember? Yum! Yum! My sweetie and I were just talking about the Cottage fam. Dahlink – That is the biggest residential pond I have evah seen. And to think you have another one in the enchanted forest. I must go now. I need to plug “enchanted forest” into your search box. Three ponds going on four? All because of extra plants. Dahlink, you do know Craigslist has a “free” section where you can put in a “curb alert” so that you don’t have to deal with them when they come. I got a free range hood, in excellent condition, for Poppie and to this day, I don’t know whether I was communicating with a man or a woman. She/he/it told me it would be on the porch, I promised to be there by noon the next day and the ad was pulled immediately. Nevah evah throw plants out when you can put them on Craigslist for someone who desperately wants to garden but is on a tight budget unless your area is too rural and it would put you at risk. In that case, donate to the garden clubs. Those fish are so beautiful. Glad you were able to save them. That’s quite a pond!! I love Stacy’s recipes too. Also, her deodorants…made without aluminum, they feel and smell divine. I’ve been thinking about you, hoping for happiness to surround you. Your posts bring me such a lift. Hugs! You are so sweet – thank you for the shout out! 🙂 Your pond is AMAZING!!! I love it! 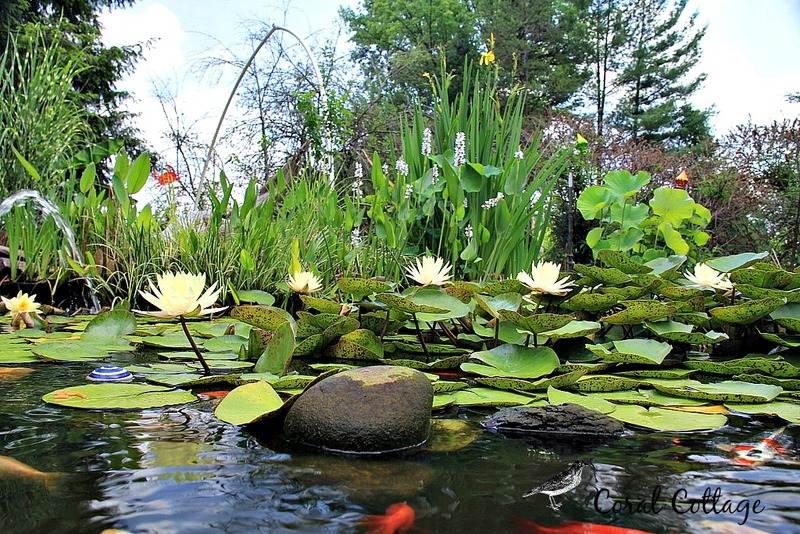 We have a pond on our “someday” list. What wonderful photos and such a beautiful post! You are so lucky to have such a gorgeous pond-ponds I should say….After eaves dropping on your other comments-It makes my heart sad to know you are still in some kind of battle, that things are not perfect and easy for you in some way-I know we all have molehills-but I suspect you have some mountains, and I’m sorry. You cross my mind so much, and I pray for you. I do pray things will get back to being normal for you. Your friendship means so much to me! 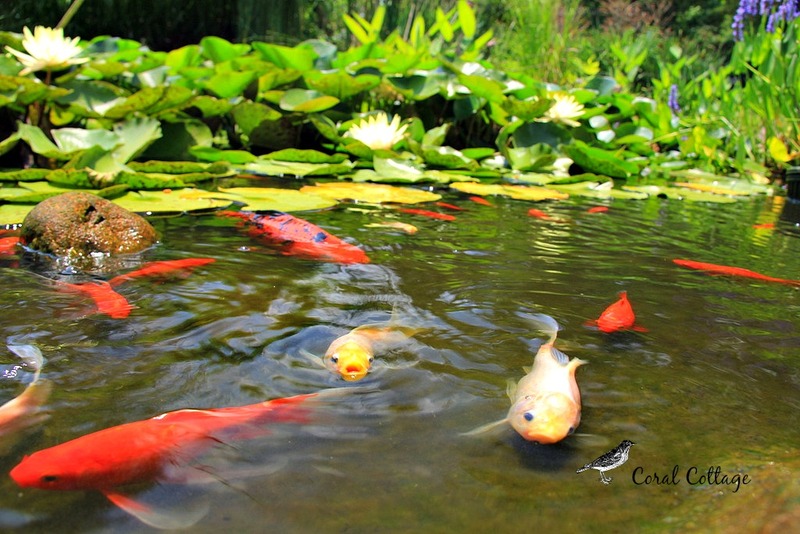 What a fabulous pond you have Kim and beautiful fish. 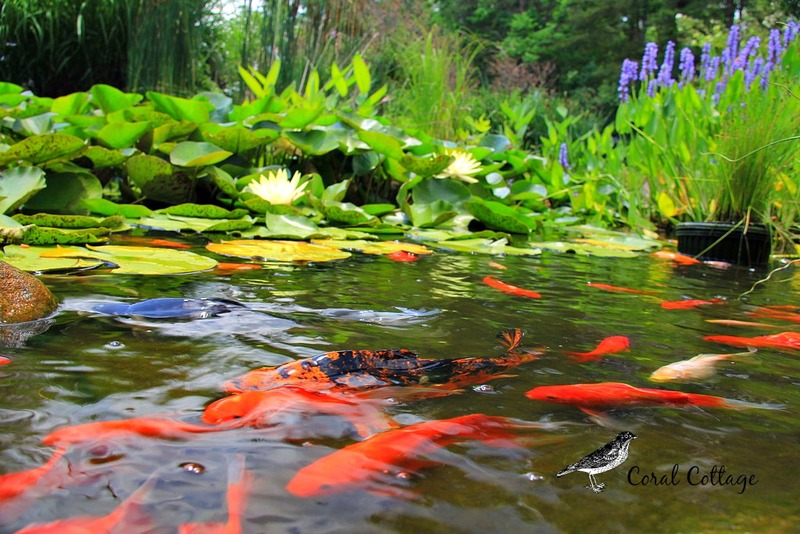 My parents have a pond like this but only the black fish have survived due to their camouflage. The orange ones were eaten by water birds!